Check or Money Order Please ensure that all checks are made payable to "Jennifer's Appraisals, Inc.". Credit Card Let us know that you will be paying by credit card and use our convenient PayPal Mobile Card Reader. Alternatively, we can email an invoice through PayPal to be paid prior to our appointment. 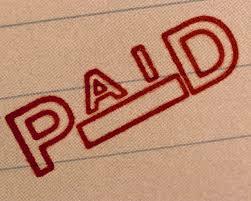 Pay by Mail If you prefer, you may mail payments to Jennifer's Appraisals, Inc., 8362 Pines Blvd., Ste. 135, Pembroke Pines, FL 33024.